Marinade the ginger in the lemon juice, 30ml of oil, soy sauce and cuttlefish ink. Mix together in the blender to make a sauce for decoration. Heat 40ml of oil in a saucepan and gently fry the shallot, then add the Venere rice. Continue making the risotto by adding the boiling hot stock a little at a time. Meanwhile split the crayfish down the back and remove the black intestinal vein. Pour the rest of the oil into a saucepan, and quickly cook the crayfish tails and small squid on one side only, without any seasoning. Keep warm. Finish cooking the risotto and adjust seasoning. 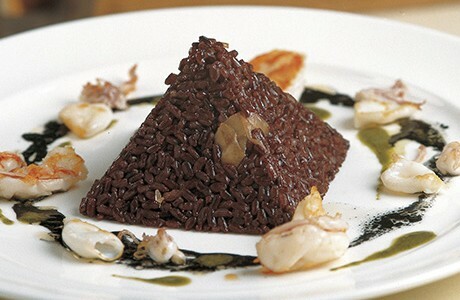 Line 4 pyramid-shaped moulds with cling film and fill with the risotto, pressing down firmly. Turn each one over onto the centre of a plate and arrange the crayfish tails and small squid around the bottom. Drizzle with the previously prepared sauce.